Tomorrow, I’ll be starting a last minute family bereavement trip to the UK. I booked this trip two days ago. Last-minute international trips are always expensive, as you cannot take advantage of advance purchases and do advanced planning. International phone roaming charges are one of the larger expenses on last-minute trips because you don’t have the time to find a decent alternative to communications. In the past, I’ve relied on Verizon Wireless as my primary mobile carrier. In checking their website before writing this article, I found their roaming charges for the United Kingdom to be $1.79 per minute. At $1.79 per minute, to make a 20-minute call to my wife in the States, it would cost me $35.80. And if I did this each night I’m staying in the UK; my phone bill will be an additional $214.80. Two years ago to save money, and before switching to T-Mobile, I would buy a SIM card from Telestial. I would insert this SIM card into an unlocked GSM phone I purchased from Amazon. Using this method, I was able to get my roaming charges down to 50 cents per minute. Still it’s a bit expensive, but nowhere near as bad as $1.79 per minute. I would also use Skype to make calls back home, and this saved me a lot of money too. The biggest problem turned out to be not having a single point of contact/phone number when out of the country. People were confused as to which number to call to talk to me. I needed one inexpensive phone number to give out. On this trip, fortunately, I don’t have to worry too much about my mobile phone international roaming charges as I did in the past because I’m now with T-Mobile on their Simple Choice Plan. I’ve been using T-Mobile for 18 months now and trust me I did my research before signing up with them. Before 2012, I wouldn’t have gone anywhere near T-Mobile. They had the least amount of coverage out of the four top U.S. carriers, didn’t sell the iPhone, other product offerings were limited, and not competitively priced. In addition to this, the company didn’t understand the U.S. market. Who remembers the expensive T-Mobile Wi-Fi Hotspots at Starbucks? Case and point! In September 2012, John Legere joined the company as Chief Executive Officer. John has bought the T-Mobile along leaps and bounds over the last four years. His innovative thinking and ideas have turned the company into a competing force. It has made additions to subscriber growth and has been aggressively expanding coverage. T-Mobile’s low-band 700 MHz spectrum deployment is also well under way, serving 28 of the top 30 U.S. metropolitan areas. The advantage of low-band 700 MHz spectrum is its ability to penetrate buildings and propagate further afield than the 1,800/1,900 MHz spectrum currently used by most digital carriers in North America. I signed up for T-Mobile service and their Simple Choice Plan back in November 2014. At first, and I must admit, I was skeptical. I was concerned about things I heard regarding poor coverage here at home, and how well my phone would work when out of the country. I did take a risk and splurge a little; I bought the Google Nexus 6 smartphone. It turned out to be an excellent decision, as the Nexus 6 is one of the first phones to receive Android updates and patches when released. But let’s get back on track here, the number one reason why I decided to go with T-Mobile was the 20 cents per minute for voice calls while roaming in 140+ countries. When returning home from an overseas trip, I no longer dread opening the phone bill as I once did. And, I have one, “you can reach me anywhere”, phone number. Although the unlimited data is 2G, 2G data speed is good enough for browsing, checking emails and using the phone’s GPS guidance and maps. As for my home market coverage concerns, these turned out to be unfounded with my Nexus 6 phone. My phone received an over-the-air update allowing it to make and receive calls on the 700 MHz spectrum. Coupled with Wi-Fi calling, which incidentally other carriers are now offering, I don’t have any coverage issues at home. Tip: If you need a local number in the country your visiting try www.sonetel.com. They offer telephone numbers on a pay as you go basis in over 200 countries that you can forward to your mobile with no contracts or long term comments. 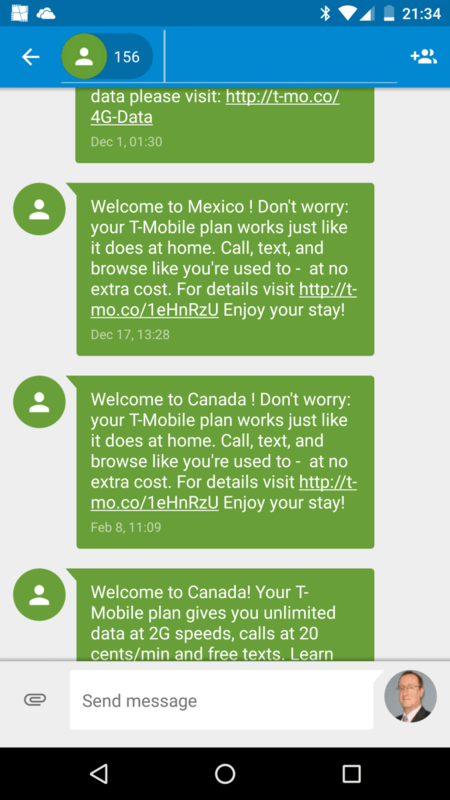 A few months after signing up, T-Mobile announced in one of its Un-carrier moves, the Simple Choice North America Plan. 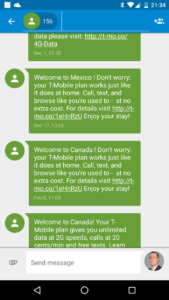 This plan offers home rates roaming in Mexico and Canada. Simply put, no roaming charges for calls, 4G data and text messages while in one of these two countries. The other domestic carriers charge upwards of $.69 per minute roaming in these two nations. When traveling abroad, my T-Mobile phone works surprisingly well. It does take a little longer to register on a mobile network when switching back on, or taking it out of airplane mode after landing because the previous mobile system is no longer available and has to hunt for an alternative. 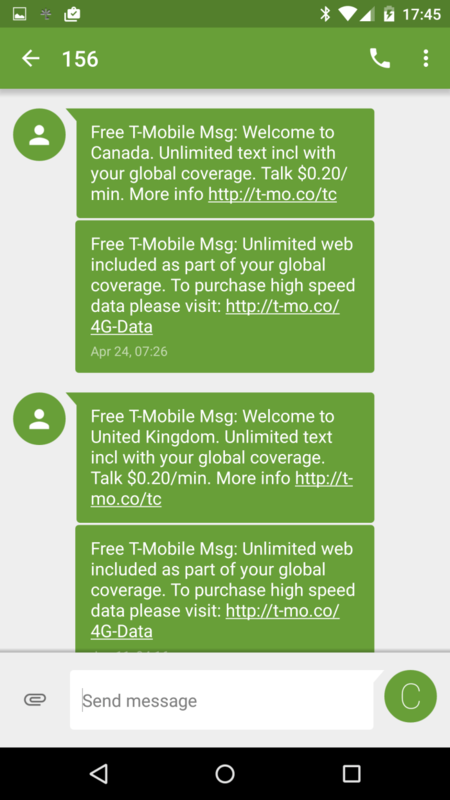 A few minutes after finding and connecting to an alternative network, I receive a welcome text confirming the pricing for the country I’m visiting. Now, I can use my phone, and it works the same way as it does back home in the States. There is one small minor exception, you do need to dial +1 before each U.S. number, but this is no big deal. If the 2G data speed is too slow for you, T-Mobile offers 4G high-speed data passes available from its website. A nice feature with all T-Mobile phones is Wi-Fi calling. I like the idea of Wi-Fi calling, for starters, it takes the calling loads off mobile cell towers freeing up network capacity. But if you travel a lot like I do, there are two other cool things that Wi-Fi calling offers. First, most airplanes now have onboard Wi-Fi. By connecting your phone to the onboard Wi-Fi and login in, not only can you surf the Internet but you can send and receive text messages too. If you fly Delta Air Lines, sending and receiving T-Mobile text messages is free on the Gogo in-flight network. When overseas and connected to Wi-Fi, making and receive calls to and from the United States is free, saving even more money. 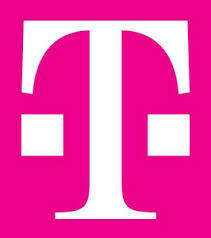 T-Mobile also offers its customers two additional perks when on its home network in the United States. These two perks are Music Freedom and Binge On. Music Freedom and Binge On allows T-Mobile subscribers to stream music and video from select services without using their monthly data allotment, how cool is that? As you can see from above, by switching to T-Mobile, I’m saving a lot of money on international roaming fees and charges. It has allowed me to have one phone number as my primary contact number, regardless of whether I’m at home or overseas. 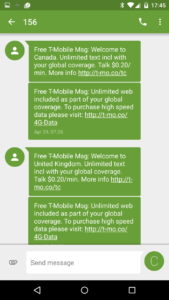 One thing worth noting, as part of T-Mobile’s terms and conditions; international roaming as a T-Mobile USA subscriber is not intended for extended international use, you must reside in the U.S., and primary usage must occur on T-Mobile’s U.S. network. 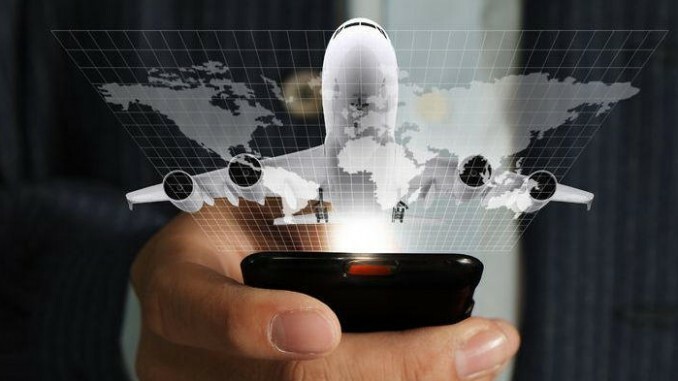 Do you travel internationally with your U.S. mobile phone? If so, please feel free to share your international roaming experiences by leaving comments here at the end of this article.